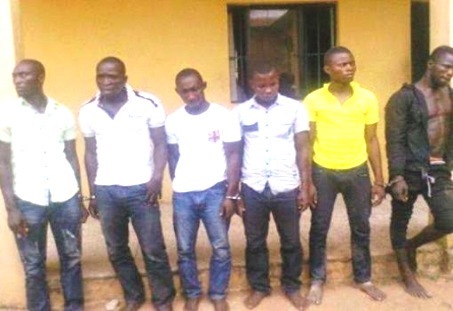 LAGOS APRIL 8TH (URHOBOTODAY) The six young men you see in this photo are the suspected kidnappers of Chief Ebikeme Clark’s son of Ijaw national leader, Chief Edwin Clark, who was kidnapped in his Kiagbado community last Wednesday and released on Sunday morning. They were paraded before newsmen this morning by the Delta State Police Command. Parading the suspects at the state Police Headquarters in Asaba, the State Police Public Relations Officer (PPRO), Celestina Kalu, who stood for the Police Commissioner, Ikechukwu Aduba, said each of the suspects played different roles in the abduction of the victim. Kalu said that Joshua Ogofa, the mastermind of the conspiracy and a native of Kalafigbene in Bomadi LGA who was said to be the driver to an ex-militant warlord, allegedly provided the AK 47 rifles used for the operation. David Emevor, a native of Kiagbodo, allegedly plotted the kidnapping,while Bosin Kevwe, a native of Aladja, allegedly provided the Audi 80 saloon car used for the operation. Sylvester Dio, a native of Isaba in Obge-Ijaw in Warri South LGA, is said to have provided the speed boat for the operation. Pius Arhavwaren, a native of Olota in Ugheli South, allegedly provided the motorbike for the operation in connivance with Prince Meslore. The PPRO disclosed that four persons are still at large, and urged members of the public to aid the police with useful information to facilitate their arrest.